Louis Boutet de Monvel (1851 – 1913) was a French painter and illustrator whose family had produced several artists. He attended the École nationale supérieure des Beaux-Arts, in Paris, where he was a student of Alexandre Cabanel, Gustave Boulanger, Jules Joseph Lefebvre and Carolus Duan. (Wikipedia) Moreover, he showed his work at the Salon de Paris, a juried exhibition, where he won a medal in 1878 for a painting called “The Good Samaritan,” which the internet would not allow me to copy. However, we have a link. Boutet was therefore, at first, an academic painter and had been exposed to the Neoclassicism of Jacques-Louis David, whose painting of Marat dead in his tub has become iconic. However, David’s Neoclassical style is better exemplified by his Oath of the Horatii (1784). We should also remember that as the Neoclassical style lost its popularity, there emerged schools such as the Barbizon School‘s plein-air painters (1830-1870) that favored realistic and representational painting but without the imprecision of Impressionism, a movement that flourished in the 1870s and 1880’s. Moreover, painters associated with Post-Impressionism often doubled up as illustrators and decorators. Art Nouveau (1890-1910) artists, some of whom are linked with Post-impressionism were interested in the decorative arts. They had to make a living and their clients were privileged. But Boutet de Monvel is remembered not for his academic paintings, but for his work as a children’s books illustrator. His main achievement in this regard is an illustrated children’s history of Joan of Arc, published in 1895. It brought him recognition and renown. But earlier Boutet had also illustrated a book of songs for children: Chansons de France pour les petits enfants. Several years ago, I purchased a copy of a hardcover edition of Boutet de Monvel’s Chansons de France pour les petits enfants (Songs of France for Children). It is a beautifully illustrated book published in what was the golden age of illustration and posters: the Post-Impressionism of the late nineteenth century and the age of fabulous posters (Henri de Toulouse-Lautrec, Théophile Steinlen) and illustrations often executed against a blank background, such as Léon Bakst‘s designs. 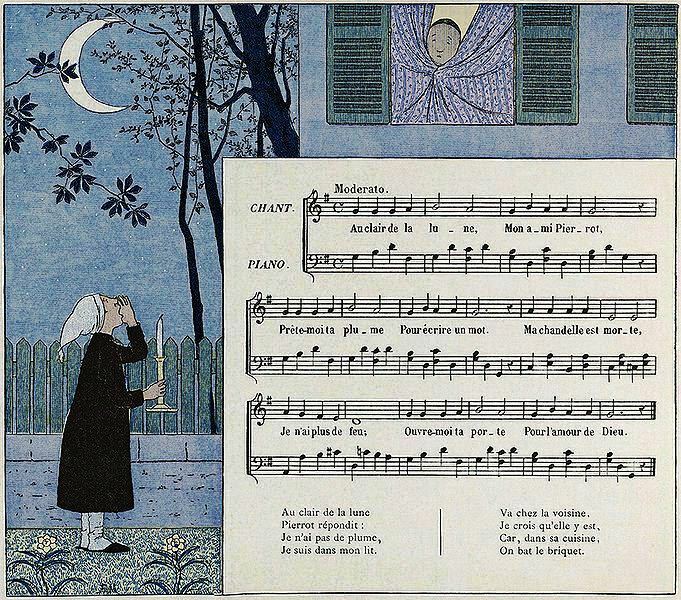 In Chansons de France pour les petits enfants, whenever the page includes the score and the lyrics, the illustrations are the background. But, as we can see below, in the Gallery, the background of the cover page of the Chansons is coloured but blank. A fine characteristic of Boutet’s Chansons de France pour les petits enfants is the successful combination of three elements: the illustration, the score, and the lyrics (sometimes abridged). In order to combine these three features, Boutet either knew music or hired an assistant. However, no mention is made of a collaborator. For that matter, no collaborator is named with respect to Boutet’s Jeanne d’Arc (Joan of Arc). 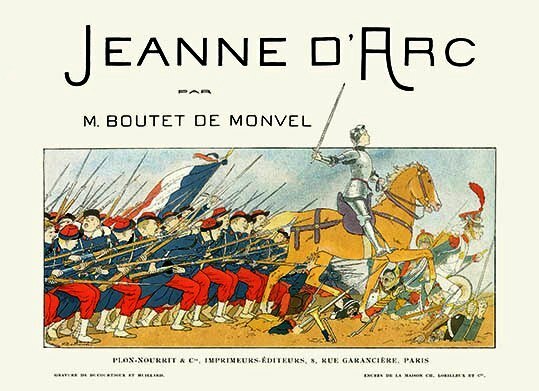 Boutet’s Jeanne d’Arc seems altogether the work of an eclectic Boutet de Monvel. Yet Monvel collaborated with Nobel-laureate French writer Anatole France (16 April 1844 – 12 October 1924) in the creation of Nos enfants: Scènes de la Ville et des Champs (1887). Nos enfants is an online publication which, unfortunately, does not show illustrations. This would have been Boutet’s contribution. It may be, however, that Boutet influenced Anatole France, not as an artist but in the choice of Joan of Arc as a subject-matter. Zeitgeist played its role, but the more immediate example was Boutet de Monvel’s Joan of Arc. 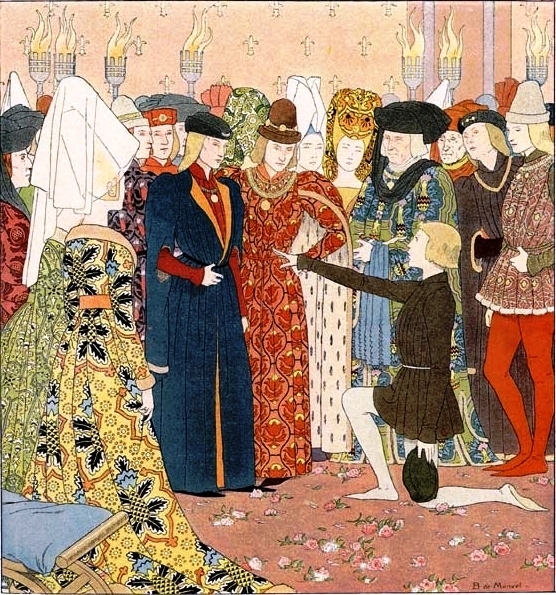 In 1908, thirteen years after the publication of Boutet’s Jeanne d’Arc, Anatole France published his Vie de Jeanne d’Arc. Boutet’s Joan of Arc was translated into English and, during a trip to the United States, in 1899, the beauty of his illustrations brought Bouvet a commission “by a wealthy American.” He was asked to create “a series of large scale panels based upon his Joan of Arc illustrations” (Wikipedia). These panels are housed at the Corcoran Gallery of Art, in Washington, DC. But, let us return to the Chansons de France pour les petits enfants. It would appear that Au Clair de la Lune was composed by Italian-born Jean-Baptiste de Lully, Giovanni Battista Lulli, (28 November 1632 – 22 March 1687), a dancer and a composer who worked at the court of Louis XIV. If such is the case, the song was composed in the seventeenth century and not in the eighteenth century. However, it has just occurred to me that the song may have been written by Jean-Baptiste Lully fils, one of Lully’s sons. Au Clair de la Lune would then be an eighteenth-century composition. But knowing that the song is a composition is the more relevant information. Au Clair de la Lune did not go from generation to generation in an oral tradition, which is the case, for example, with Æsop’s fables. Au Clair de la Lune is not folklore, although it may have entered folklore for lack of an identified composer. I have a great deal of admiration for illustrators. Their work is reproduced, but artistically it does not take a second place to the original. The difference is financial.